From spring through fall there are yellow wildflowers in bloom along forest margins, roadsides, and unplowed farm fields. The flowers are actually a sequence of species that bloom at different times. These plants are able to secure insect pollination by not competing with but a few species in attracting the available insects. Buttercups are the first yellow wildflowers to carpet the ground in the Arkansas Delta. They will be followed by groundsel, tickseed coreopsis, golden asters, bitterweed, and goldenrod. 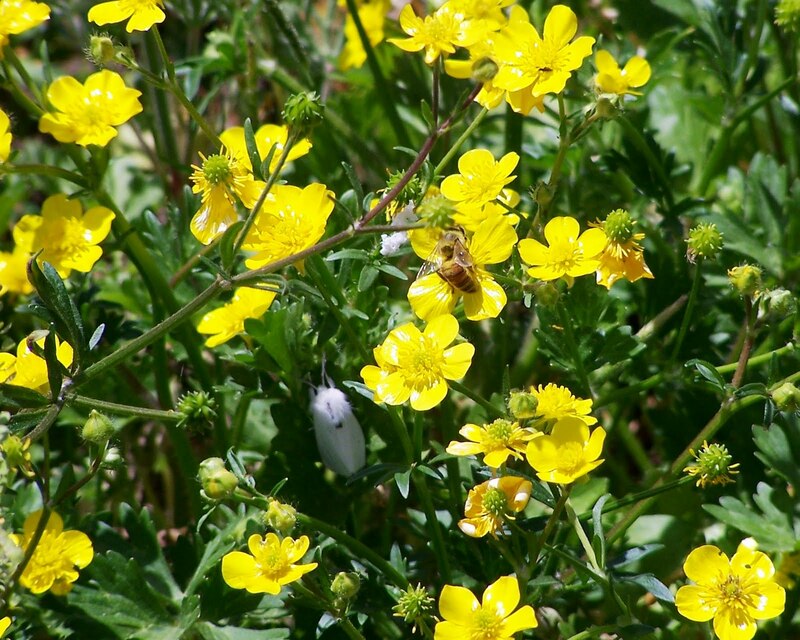 Pollinators like the honey bee and moth shown in today’s photo are attracted to the bright, yellow buttercup flowers, which have a waxy surface giving the flower the appearance of being wet with dew. In the Mid-South, the spring of the year always sees the clash of warm, damp air rising from the Gulf of Mexico meeting the year’s final arctic cold fronts. The result is predictable rainfall to support ample flowering plants for the honey bees and other pollinators. Strong cold fronts bring violent thunderstorms and tornadoes to the region. Peace Bee Farm and the surrounding area were struck by a series of severe storms over the past three weeks. Blown from a barn, broken lumber and sheets of steel roofing struck queen mating nucleus hives, scattering hives and bees. Small clusters of bees sheltered young queens in nucleus hives exposed to the weather. I added nurse bees to boost the population of these hives. Roofers placed temporary coverings over our house’s damaged roof. Lighting struck the honey house, and damaged some honey-handling equipment. An electrician rapidly repaired the wiring; burned fans and lighting fixtures were replaced. The electrical power lines were damaged as well. A lineman in a tall bucket truck repaired wind-strained wiring and replaced fuses. All of these workers efforts are especially appreciated after such storms. Each worked cheerfully conducting important, tiresome, and sometimes dangerous repair tasks. After a short upheaval, our bees remain in dry hives, and honey flows from the honey house. Thanks to all. The beekeeper’s calendar follows the honey bee’s life cycle more closely than our calendar on the wall which is based on dates of the year. Activity in Peace Bee Farm’s hives in the Arkansas Delta leads those of our beekeeping friends in New England by about seven weeks, and it lags behind our New Zealand friends’ hives by about six months. Since honey bee activities are timed differently in various areas, beekeepers watch the bloom of certain flowering plants to help predict events in the bee hive. One of the significant observations for many is the bloom of the black locust tree. To them, the black locust tells when to expect the queen to be at her maximum egg laying production. This can mean that the beekeeper can rear new queen bees in cell builder hives. It can also mean that swarm season is rapidly approaching. At this time, colonies often replace their queen through supersedure or create a new queen and divide the colony through swarming. 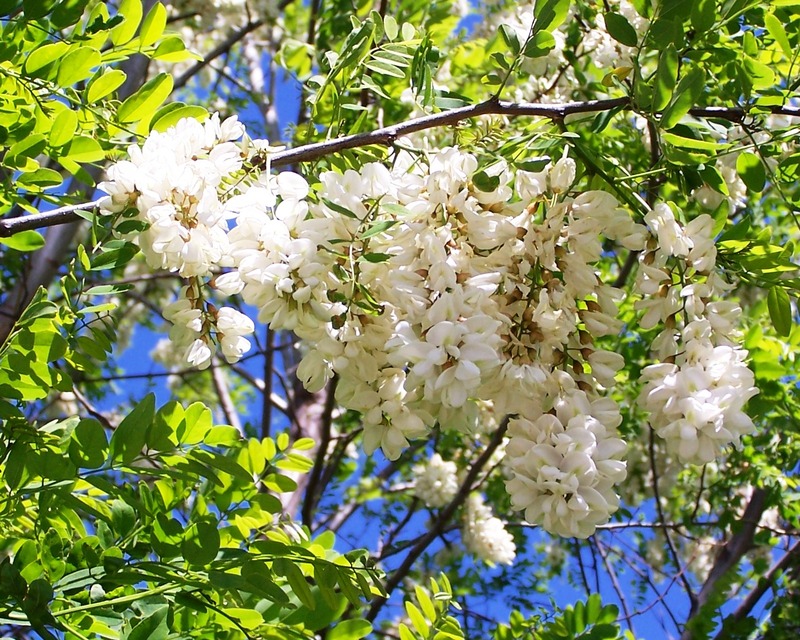 When in bloom, the black locust is easily recognizable along the margins of woodlots or suburban landscapes by its large clusters of fragrant, bright white blossoms. These trees, which reach 80 feet, may attract large numbers of honey bees as well as other bees; however, the black locust nectar flow is not consistent from year to year. In some years the relatively weak black locust nectar is not as attractive as other plants blooming at the same time, and few honey bees are seen working the locust flowers. In other years an abundant surplus of tasteful, light-colored black locust honey may be harvested. The black locust is a member of the legume family. The legumes are important bee plants because they produce ample amounts of nectar and pollen. The honey locust, another legume, is similar in appearance, and it produces flowers with the fragrance of honey. However, the honey locust, which sports eight-inch thorns, usually does not produce a surplus of honey. Every geographic area has its own challenges for honey bees. The bees in different locals experience varied weather as well as pests, pathogens, and parasites. Honey bees that thrive in one area may not be able to survive in a different area. A number of beekeepers are attempting to rear honey bees in their own area rather than relying on bees purchased from afar. They feel that the locally produced honey bees stand a better chance of surviving in the local environment. Recognizing the importance of honey bees for crop pollination, the Tennessee Department of Agriculture is helping the Tennessee Beekeepers Association fund a program to rear queen bees. The queen bees will help supply Tennessee beekeepers so that they can fill vacancies in pollination needs. In today’s photo, Kent Williams, demonstrates queen grafting techniques to Shirley Murphy. They transfer one-day-old larvae into queen cell cups, and then they move the cell cups to a cell builder hive. The cell builder hive is established by brushing a large number of bees from frames of capped brood. The bees are of various ages, and they may come from different hives. With a large population of bees, plenty of food, and no queen present, the bees in the cell builder have a strong desire to create a new queen. When these bees are presented one-day-old larvae, they will begin feeding them royal jelly to begin the physiological changes that make the larvae develop into queens. As the larvae are being fed, other workers extend the queen cell cup into a queen cell using beeswax. The queen is encapsulated in a cell shaped like a peanut shell and resembling in size, shape, and texture. Two days before the queen emerges as an adult, the queen cells are moved to queen mating nucleus hives holding bees to tend to the new queens. As the newly trained beekeepers gain experience in rearing queens, they will share their best stock to develop a hearty Tennessee bee. 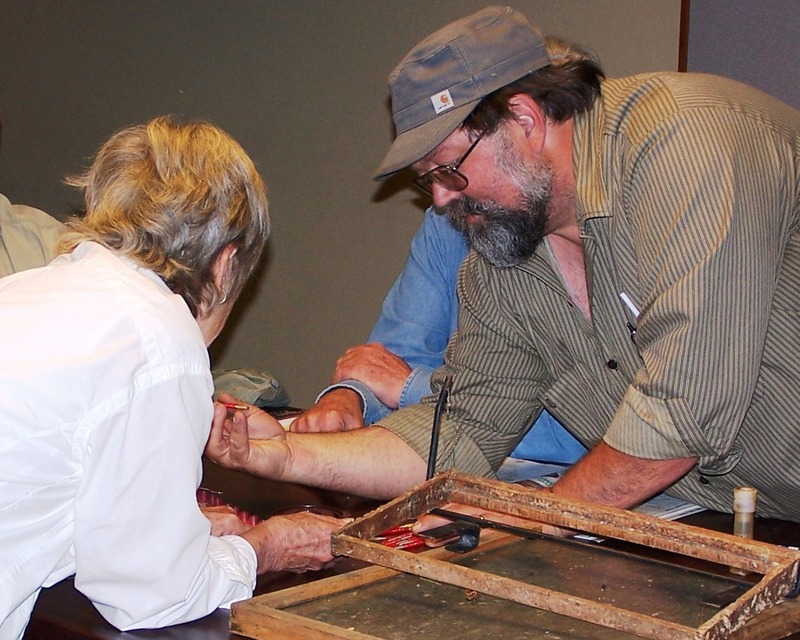 A story in The New York Times paints a picture of the changing landscape of Appalachia. Not only are the communities gradually disappearing, the silhouettes of the mountains themselves are. The descriptive Times piece, “As the Mountains Fall, a Coal Town Vanishes,” (http://www.nytimes.com/2011/04/13/us/13lindytown.html?) reveals how coal mining is shifting from underground work in mines to mountain top removal. The process involves removing the trees, soil, and rock, what the coal companies call “overburden,” to expose coal. The coal is heavily relied upon to provide energy to power our industrial world. In accessing the coal, large volumes of removed soil and rock are dumped and dozed into ravines to form a shape called an “approximate original contour.” This reclamation process often turns the thin mountainous topsoil under the removed rock and gravel leaving a surface unsuitable for vegetative growth. Even when the rubble is fertilized, mulched, and seeded, plants and trees do not thrive. Valleys and creeks are often filled with rubble as well. Our eastern Kentucky beekeeping friend, Tammy Horn, received the Pollinator Advocate award from the North American Pollinator Protection Campaign for her efforts to encourage and guide the coal companies in changing mountain top removal practices to be more environmentally favorable. New approaches to reclamation include reduced compaction of soils and plantings of bee plants like American chestnut, sourwood, and understory herbs. Tammy is working to establish a cottage industry of beekeeping in the economically depressed coal mining region of Eastern Kentucky and West Virginia. Tammy has been a true advocate for both the pollinators and the people of Appalachia. 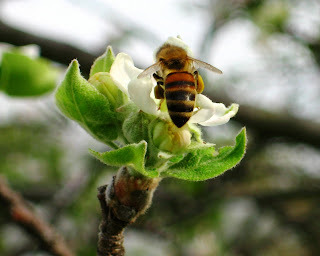 Click on today’s photo of a honey bee heavily laden with pollen from apple blossoms. Apples, members of the important family of bee plants, the roses, rely upon bees for pollination. Without the bees, no fruit is produced. Apples, which contain both soluble and insoluble fibers, are known as a healthy food. Apples are blooming in the Mid-South. The apple bloom is another landmark on the beekeeper’s calendar. Along with helping individuals share their enjoyment of growing flowers and plants, garden clubs are effective groups for spreading information on horticulture and for raising awareness of environmental issues. The Memphis Herb Society invited me to speak to their group. I gave a presentation on the relationship between the herbs, people, and the honey bees and other pollinators. Many of the herbs are flowering plants that rely upon the bees for reproduction. In turn, the bees receive food from the flowering herbs. We use herbs for flavorings in our cooking, for medications, and often simply for enjoyment. Many of the culinary herbs, like thyme, rosemary, and sage, are excellent bee plants. Thyme is used to produce control treatments for parasitic honey bee mites. Herbs are used to produce many of our important medications. Some herbs, like lemon balm, bee balm, and hyssop, are grown for their fragrance. These herbs in the mint family are all important bee plants producing nectar and pollen. I encouraged the members of the Herb Society to make their plantings “pollinator herb gardens.” I told them that their herb gardens designed to attract, feed, and provide nesting areas for pollinators would eventually be connected to other pollinator gardens and pastures by a series of pollinator corridors. One of the plants that I featured in my presentation to this environmentally conscious group was the black willow, which is now in bloom. Willows are trees that grow along the banks of waterways. They are important medicinal plants that were used by American Indians for their anti-inflammatory and antiseptic effects. An Italian professor extracted salicylic acid from willow flowers and buds in 1838. 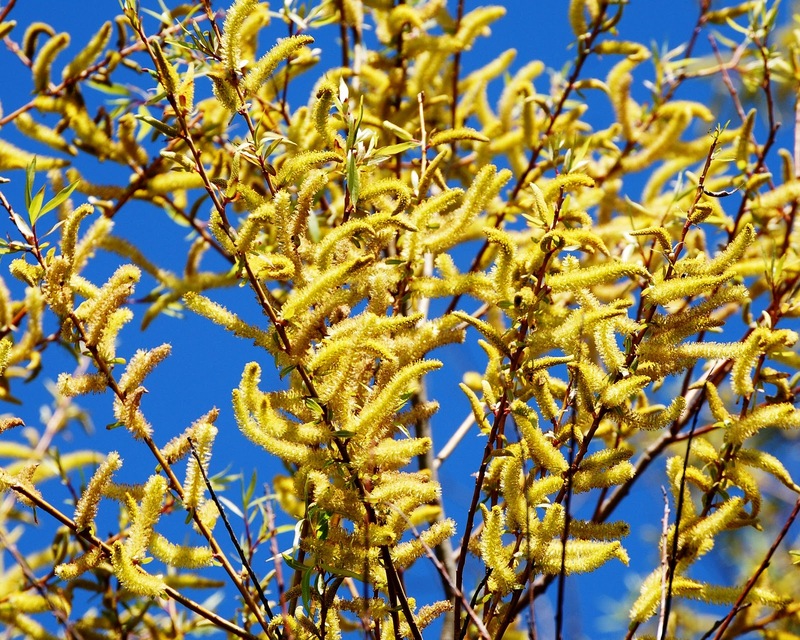 In 1899, Bayer created the name “aspirin” by rearranging the genus name for meadowsweet willow, “Spirea.” Willows attract large numbers of honey bees to river bottom lands to fly among golden-colored catkins. These are clusters of flowers without petals; the willow is evolving a reproductive strategy relying upon wind pollination to replace insect pollination. There are a number of reasons that people engage in tending to honey bees. For many the bees are used to provide pollination of crops. Migratory beekeepers carry hives great distances to provide pollination service to farms and orchards as crops come into bloom. Other beekeepers tend to stationary bee hives to provide pollination service and produce honey crops. Commercial beekeepers grow bees to sell the queens, packaged bees, and nucleus colonies. Homeowners and gardeners tend to bee hives to produce honey and pollinate home gardens. Observation bee hives are kept in schools, zoos, museums, and public areas for educational purposes. Colleges and universities maintain bee yards for teaching and research. Some people keep honey bees simply for the enjoyment of watching and listening to the bees. Many of these enthusiasts never harvest any honey. In today’s photo, Mary Phillips is building bee hives for the Urban Farms in the Binghampton neighborhood of Memphis. 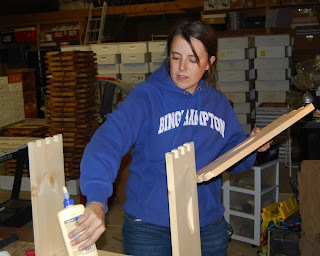 She is assembling Langstroth hives in the wood shop at Peace Bee Farm. We always enjoy having her back at the bee farm. She worked with us to gain experience in beekeeping, and now she is adding honey bees to the Urban Farms to ensure pollination of their crops. The Urban Farms regularly see visitors; many are neighborhood children who are not aware of the source of food or how it is produced. For them the bee hives will help explain the important role of pollination in food production. The Urban Farms and their manager, Mary Phillips, are working to ensure the inner city area has access to healthy, locally produced food. The Urban Farms was voted a Local Hero award by the readers of Edible Memphis magazine. Edible Memphis, a quarterly magazine devoted to the harvest of the Mid-South builds ties between farmers, food artisans, and the community. The magazine can be found at www.ediblememphis.com. You can follow activity at the Urban Farms at http://www.bdcmemphis.org/urban_farms.html. These bee hives will pollinate and educate. The sight of purplish-red color splashed through the understory of the woods is a true sign of spring. Redbud trees are in bloom throughout the Mid-South. These small trees covered with pink or rose flowers are easily recognizable from a distance. They grow under the oak and hickory cover of the woods and along ditch banks and forest margins. Redbuds are propagated by seeds that hang in pods, and are distributed by songbirds and the wind. In suburban settings, the colorful redbud is a cultivated favorite for landscape plantings. Honey bees are attracted in great numbers to the bright pink to rose-colored flowers which cover redbud twigs, stems, and even trunks. 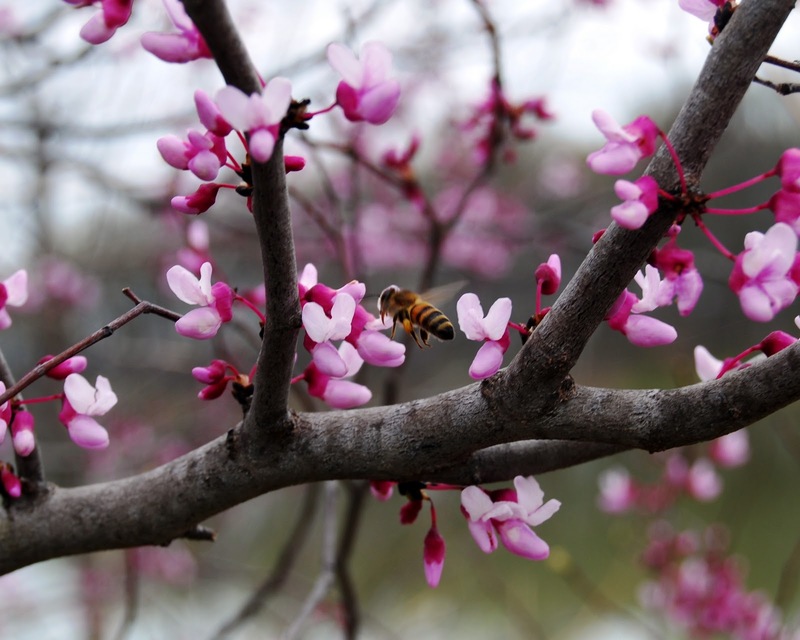 Honey bees do not make a surplus of redbud honey, but the tree does provide a dependable source of both nectar and pollen at an important time when bees are rapidly expanding their colonies and need all of the food they can gather to feed the brood. The redbud is a member of the important family of bee plants, the legumes. The legumes, or pea or bean family, includes many of the most prolific producers of nectar for honey. Many of the legumes are forage and food plants. Clover is a legume, as are alfalfa, peanuts, lentils, lespedeza, peas, beans, wisteria, and vetch. Like the redbud, a number of trees are legumes. Among them are the black locust, honey locust, mimosa, and Kentucky coffeetree. By pollinating the flowers of legumes, the honey bees play an important role in producing seed, and help produce food for humans as well as livestock and wildlife. The seeds of the legumes are contained in pods that resemble peas or beans. Many of the legumes also serve the environment by enriching the soil. Bacteria growing in nodules on the roots of legumes take nitrogen from the atmosphere and convert it in the soil to a usable form for plants to absorb. In this way these plants actually enrich the soil.